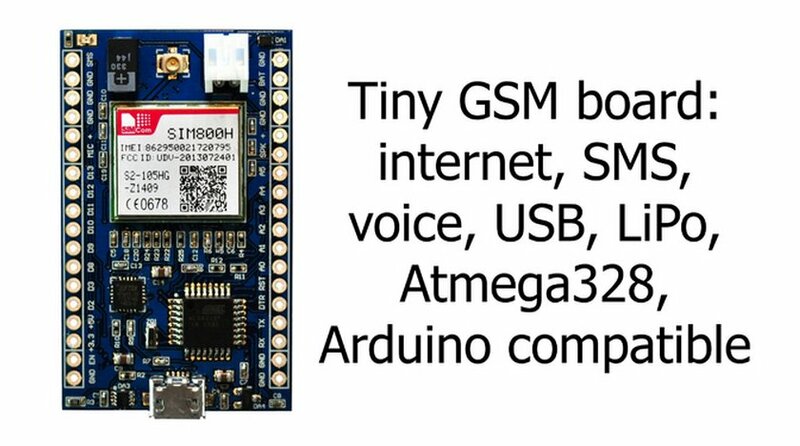 The MicroLink GSM is a tiny self-contained Arduino inspired board that can do automation, alerts, cellular data, phone calls, SMS text messages, and much more that is also FTDI compliant for USB plug & play. The project is currently being promoted on kickstarter.com. It combines an an Arduino compatible Atmel328 micro-controller with a SIM800H quad band GSM module and provides on-board battery (3.7V Lithium Ion Polymer) connector in a tiny package that is only 50x32mm in size (about a third of the size of a credit card). It hosts 13 GPIO pins (digital and analog) and connectors for a tiny speaker and microphone. An interesting offering is the default sketch loaded on the device that provides the unique ability to interface with the device over SMS to obtain information such as the battery level, alerts, listen to the microphone or read or write to the various GPIO pins on the device. The project claims the device is very low power - boasting a 6 µA power rating in sleep mode. For projects that may need to additional storage space there is also a version that incorporates a 4Mb 104MHZ SPI FLASH chip that in addition to providing more storage also allows for over-the-air wireless programming - great for remote or concealed projects. Unlike many kickstarter.com projects that offer dreams and inspirations - the device is already built and in use and has been extensively tested so the campaign is purely around discovery and promotion and as such is a low-risk investment; I will order mine now! Gemalto Concept Board - what will you create? IoT Nightmares - Doomsday on the horizon?